White Owl Pineapple 2 for 99¢ Cigarillos Cigars are refreshingly sweet and fruity. This filler blend is rolled using a homogenized sheet binder and wrapper which add a touch of smoothness to the taste. 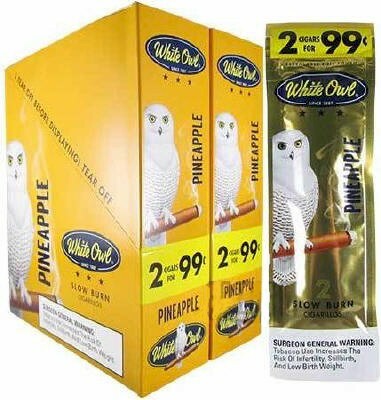 The White Owl Pineapple 2 for 99¢ Cigarillos infused pineapple flavor augments the flavor, giving you a delightfully complex smoke. The intense flavor of this tropical fruit evokes images of sunshine and beaches. Come packaged in 30 packs of 2, in foil fresh pouches for guaranteed freshness.